If all of your teeth are missing or in severe condition and need replacing, one of the best solutions is a fixed bridge anchored to dental implants. Previously, dentures were the only solution for people who lost all their teeth. Nowadays, a full arch replacement with dental implants and a fixed bridge can give you the permanent, stable and aesthetically pleasing replacement for your missing teeth. A full arch replacement only requires a minimal number of implants required to support the bridge to be implanted, which allows for the stability for the dentures, and less surgical work done on your mouth. What are the benefits of a full arch replacement? The full arch can be used to replace either upper or lower teeth or both. You’ll have a permanent, stable solution to your missing teeth. Your full arch replacement should last for the rest of your life. Your facial features won’t change due to missing teeth. The full arch prevents bone loss in your jaws. What happens during a full arch replacement? The number of office visits to our office varies. In general, however, the steps to having a full arch replacement are simple. Before the procedure, your dentist develops a treatment plan for your unique case. Next the dentist will surgically place the implants creating new, artificial tooth roots for your permanent bridge. 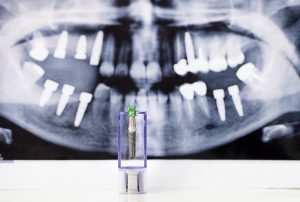 Usually the dentist will place anywhere from 4-6 implants, depending on your specific needs. Once the implants have been surgically placed you will need to wait until the implants have fully fused with your jawbone. This could take several months. After the implants and jaw have healed, the bridge is placed on the implants, and the process is complete. The bridge has been specially designed for you based on impressions that have been taken and sent to the lab. For a consultation about full arch replacement dentistry, please contact our office today and one of our helpful staff members will be happy to assist you.